Depending on how you look at things, the holidays could be seen as either an excuse to spend money or an excuse to get creative. 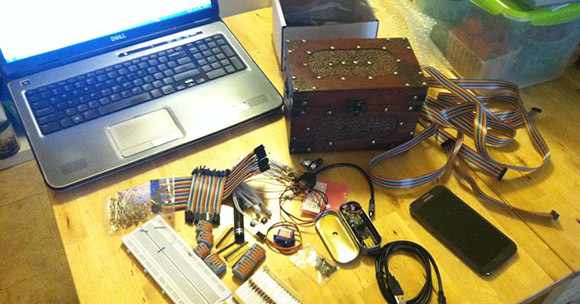 We imagine many Hackaday readers would rather head to their workbench than the mall when it comes time for gift giving, and [Sean Hodgins] is no different. He came up with the idea of hiding geocaches around his nephew’s neighborhood and building him a locator device to find them. The locator itself is intended to grow with his nephew, allowing him to reprogram it or use its parts for something completely different down the road. The main components tucked inside of the 3D printed case of the locator are an Adafruit Trinket, a GPS receiver, and a compass module. The Adafruit NeoPixel Ring is of course front and center, serving as the device’s display. 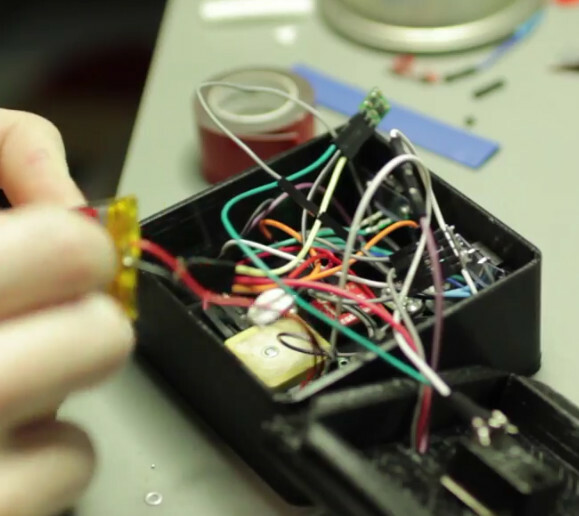 To power the device there’s an old battery, a LiPo charger circuit, and a 5V converter. One of the goals for the project was that it could be constructed out of things [Sean] already had laying around, so some concessions had to be made. The Trinket ended up having too few pins, the compass lacks an accelerometer, and the switches and buttons are a bit clunky for the build. But in the end it comes together well enough to get the job done, and at least he was able to clear some stuff out of his parts bins. To allow its owner to disassemble and potentially rebuild it into something else later, no soldered joints were used in the construction of the locator. Everything is done with jumper wires, which lead to some interesting problem solving such as using a strip of pin header as a bus bar of sorts. A bit of heat shrink over the bundle holds everything together and prevents shorts. Location-aware gadgets happen to be an extremely popular gift choice among the hacker crowd. We’ve covered everything from devices cobbled together from trash to hardware which could pass for a commercial product. Anyone remember the game Myst? Well, [Michael] and his girlfriend have been playing quite a bit of it lately, so for her birthday, he decided to make her something inspired from it. For those unaware of the classic that is the Myst series, it is a set of games that started back in 1993 where you assume the role of the Stranger who gets to explore other planets (called Ages) to solve various logical and mechanical puzzles. Anyway, [Michael] got his girlfriend tickets to visit GC319QK (a geocache site requiring diving) — since the gift is a relatively small token, it was logical for [Michael] to make a fancy box for it — and that’s exactly what he did. 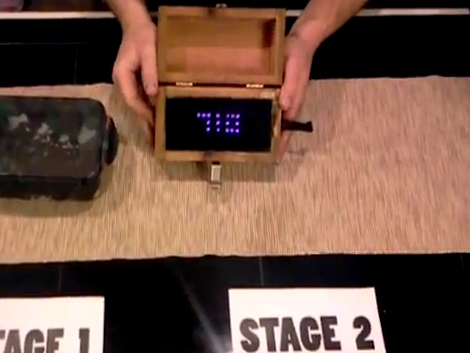 It’s a peculiar little wooden box with LEDs, a button, a latch, an unplugged wire, different rods and strange looking sensors — and it is a very clever little puzzle. We could explain to you how it works (with the Arduino, phototransistors and maybe the source code), but instead we think you’ll enjoy watching [Michael’s] video of it.